Endless spread of soft white sand, artistic lime stone hills range at the end of the beach, waves break through the reef, making a relaxing flute like sound. Yup, That’s Klayar! You could enjoy all of those in Klayar beach. 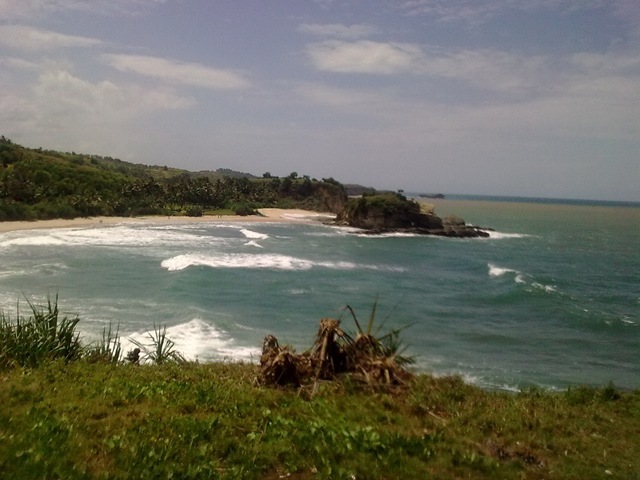 The worth-visited beach is located in Kalak village, Donorojo Sub district, Pacitan Regency, East Java. The down side is that it is challenging to get to Klayar beach, one hour drive from Pacitan. or for about three hours drive from Yogyakarta. The roads are narrow but in good condition. The landscape is enchanting. One of them is the lime stone hill range combine with the greenery that sooth your eyes. All the traveling struggle seems to be paid off when we get there. All your eyes could see the wide spread of soft white sand and the sound of the wave breaking the reefs at the tip of the beach, it just like the beach is singing. If you’re quite an adventurer, you could climb up the reef and witness the beauty of the horizon that borders with the Pacific Ocean, or you can observe the reef range below you. Unfortunately, it is not advised to dip into the sea. It may look calm and beautiful but the waves are high and strong. Many beach-goers have gone missing dragged by the waves. Even fisherman cannot fish in the Klayar Beach area, since it is too dangerous. Unless you are an Olympic winning swimmer, better not to try your luck there.